The Tamworth Agricultural Institute (TAI) is the Department's principal research institute for the cropping zone of northern inland NSW. It is a Centre of Excellence for Northern Farming Systems and is dedicated to helping ensure agricultural industries and rural communities remain economically viable and sustainable. TAI is located 10 km south-east of the city of Tamworth on the North West Slopes and Plains at an elevation of 397 m. Rainfall is slightly summer dominant, with January/December experiencing the highest monthly rainfall averages followed by a secondary peak in July. Frosts generally occur from April to November each year. Temperatures range from a minimum average of 4.2°C in winter to a maximum average of 31.9°C in the summer, with an average rainfall of 680 mm. TAI is 332 ha in area and provides a secure facility for dryland research for the agricultural industries of inland northern NSW. This is complemented by farm management designed to provide an environment suitable for research, together with the building facilities needed to support this research. TAI’s certified ISO9001:2008 laboratories are dedicated to pathology, cereal (durum) and pulses (chickpea, faba bean, field pea and lupin) quality research and soil chemistry. TAI accommodates professional research and technical support staff directly involved with the department’s front-line industry-driven research and development activities across crop breeding, pathology, grain quality and agronomy programs to drive increased productivity and profitability for northern crop producers. The majority of research and development is in partnership with industry bodies including Grains and Cotton Research and Development Corporations as well as Universities. Directly DPI employs 167 staff at the Tamworth site from various programs across DPI Agriculture, DPI Biosecurity, DPI Fisheries, DPI Game Licencing, DPI Water, and Water NSW. The Tamworth Agricultural Institute (TAI) is the NSW Department of Primary Industries Centre of Excellence for Northern Farming Systems and is focussed on ensuring agricultural industries and rural communities remain economically viable and sustainable. TAI research projects conduct applied research and development that delivers new knowledge, tools and technologies to suit regional environments, farming systems and practices. NSW DPI R&D importantly collaborates with other research providors including CSIRO, universities and state departments and with extension providers to ensure outcomes are delivered to the NSW community. NSW DPI laboratories operate within an internationally recognised quality management system to ensure that laboratory research activities and fee for service testing are conducted in a customer focused environment and produce valid, reliable and reproducible results. NSW DPI and the University of Adelaide durum breeding programs were merged in 2007/08 to create a single publicly funded and GRDC supported durum wheat breeding program. TAI is the major provider of integrated disease management, disease surveillance, and extension, education and training services throughout northern and central NSW. The unit has a long history of effectively developing and delivering integrated disease management strategies to support industry in minimising losses to the key cereal and pulse diseases in the region. The Tamworth Cereal Chemistry Unit (TCC) performs quality screening of durum wheat lines for other breeding companies on a contract basis. TCC also conducts research in collaboration with other National and International organisations on durum wheat quality, food science and biochemistry. Pasture research at Tamworth has three main components: tropical pastures, legumes for pure and mixed pastures, and soil water dynamics. This information is essential to develop productive, resilient pastures and grazing systems. The Weeds Management Unit has developed a commercial wild oat management program, investigated the effects of spray drift, responsible for improvements in weed management along roadsides and fence lines and researched cropping, pastoral and environmental weed control treatments that are currently recommended throughout Australia. The PBA Chickpea program received co-investment by the GRDC and contributes to the delivery of varieties with higher and more stable yield, fewer input requirements and improved seed quality. Increased reliability and profitability of chickpea production, will underpin continued industry expansion. In collaboration with the GRDC and the Australian Grains Genebank (AGG) in Horsham Victoria, the role of this quarantine facility is the importation, quarantine screening, documentation, characterisation and distribution of unique wheat, barley and oat germplasm. Capacity building and research programs for invasive species professionals and community is part of the work undertaken by staff including; developing and delivering training course, mentoring and training, creation and distribution of information resources and research to improve participation of community in ivasive species management. The Tamworth Soils Research team are currently investigating crop nutritional management in the dryland grains and irrigated cotton industries. This research is field-based with experimental sites on commercial farms in northwest NSW and on research stations, including the Australian Cotton Research Institute near Narrabri. Research includes; identifying crop and pasture nutrition issues, strategies for reducing fertiliser losses, extension of soil health, investigating biochar, evaluating soil water balance and productivity. “The NSW Department of Agriculture has a staff of fully trained and highly qualified scientific personnel and it is my desire to expand the research facilities available to these officers in order to give them greater scope for their activities, and thus permit the results of their scientific investigation and research being readily available to the whole farming community”. The land that was to become TAI was purchased from the Cox Estate for £32,000, with the purchase finalised in 1950. The history of the Institute is recorded from the early thirties when the Department of Agriculture (now part of Industry & Investment NSW) started wheat breeding at Glen Innes. New varieties for these programs were tested on farms near Tamworth and in adjoining districts. The land purchase referred to above allowed for the expansion of the wheat breeding program at Tamworth. Dr EM Matheson sowed the first wheat breeding plots on this land in 1955. In 1959 the Institute became the headquarters of the Department's wheat research programs in northern NSW. It was expanded in 1961 with $50,000 from the NSW Wheat Industry Research Committee and $100,000 in state funds to provide offices, laboratories and other resources. Additional land 80.83 ha was acquired from the travelling stock reserve located on the Liverpool Plains some 8 km north of the village of Breeza on the Pullaming Stock Route (now road). Since 1972 this land has been developed to provide an area for irrigated trials to complement the research carried out at Tamworth. Following considerable development at both Tamworth Agricultural Institute and Liverpool Plains Field Station, as a combined entity, Tamworth Agricultural Institute has become Industry & Investment NSW's principal research facility for the cropping belt of northern inland NSW. Tamworth Agricultural Institute (TAI) is located on the North West Slopes and Plains, with latitude 31°9'S, longitude 150°59'E, and an altitude of 430 m. Rainfall is summer dominant, with January having the highest monthly average and a secondary peak in June. Frosts generally occur from April to October each year. The nearest Bureau of Meteorology weather station (055054) is at Tamworth Airport (Oxley Lane) and is 15 km from TAI. The Institute was established in 1959 and rainfall records were commenced soon after. A site for the meteorology lawn was built in the 1960s. An automated weather station (Environdata® Mark 3) was installed in 1987 at the same site, to facilitate measurements during holidays and weekends. Manual readings are still recorded daily at 0900 hours on weekdays. Measurements made include: maximum, minimum and terrestrial minimum temperatures; rainfall; class A pan evaporation; wet and dry bulb temperature; and observations such as cloud cover, wind direction and speed, visibility, frosts, fogs, storms etc. 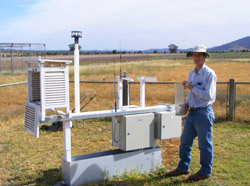 An Australian Weather Station (AWS) was installed on the same site in 2007. This new AWS conforms to the standards of the Bureau of Meteorology but has not yet been incorporated into their network.